CBD Oil contains natural calming and relaxing properties that can help those who deal with anxiety. Millions around the world suffer from stress-related conditions on a daily basis. Feelings of worry and apprehension often characterize anxiety disorders which may affect your personal, social, and physical lifestyle. It's imperative to remember that your mental health is just as important as your physical health. CBD may be the perfect remedy to help combat anxiety-related symptoms that can be brought about at any time. CBD, or Cannabidiol, is a natural compound known as a cannabinoid found in Cannabis plants. CBD Oil is the resulting product after the Hemp plant has undergone the extraction process. At Nature’s Script, we derive our CBD Oil from Cannabis plants known as Industrial Hemp. Our Industrial Hemp goes through the CO2 Extraction process to yield a pure isolate CBD Oil compound that is free of THC and any potential toxins. CBD has been acclaimed for the wide variety of medicinal qualities it carries. Humans can benefit from CBD due to the Endocannabinoid System. The Endocannabinoid System, or ECS, is one of your body’s vital systems that helps maintain homeostasis. Homeostasis is your body’s way of keeping all physiological processes in check, despite disruptions from external factors. Anxiety often interrupts your body’s homeostasis causing shortness of breath, faster heart rate, and potential panic attacks. Serving to balance homeostasis, your ECS helps manage your mood, stress, focus, sleep cycle, appetite and many other functions. To help combat anxiety, CBD Oil works with your Endocannabinoid System’s CB1 receptor. CB1 receptors are in your central nervous system and interact with your brain’s nerve cells to regulate the body’s biochemistry. Your body’s biochemistry is a working chemical process that controls your emotional response and how you process information. When you consume CBD Oil, it affects the limbic and paralimbic areas of your brain. These areas of the mind control your mood, instinct, motivation and memory response. CBD has shown to positively affect these areas, reducing anxiety related to cognitive impairment and public speaking. CBD promotes feelings of calm and relaxation to balance your CB1 nerve receptors, helping to inhibit negative brain signals. A 2011 study conducted by the Neurosciences and Behavior Division at the University of São Paulo showed that Cannabidiol (CBD) contains natural anxiolytic properties. From their research, CBD showed to significantly decrease anxiety with individuals who experience Social Anxiety Disorder (SAD). CBD displayed the ability to limit neurochemical sensory signals that produced anxiety into their brain’s amygdala (emotional response) and hippocampus (memory response). Cannabidiol may also have the potential to influence the way our brains send and receive serotonin signals. What Other CBD Products Work for Anxiety? 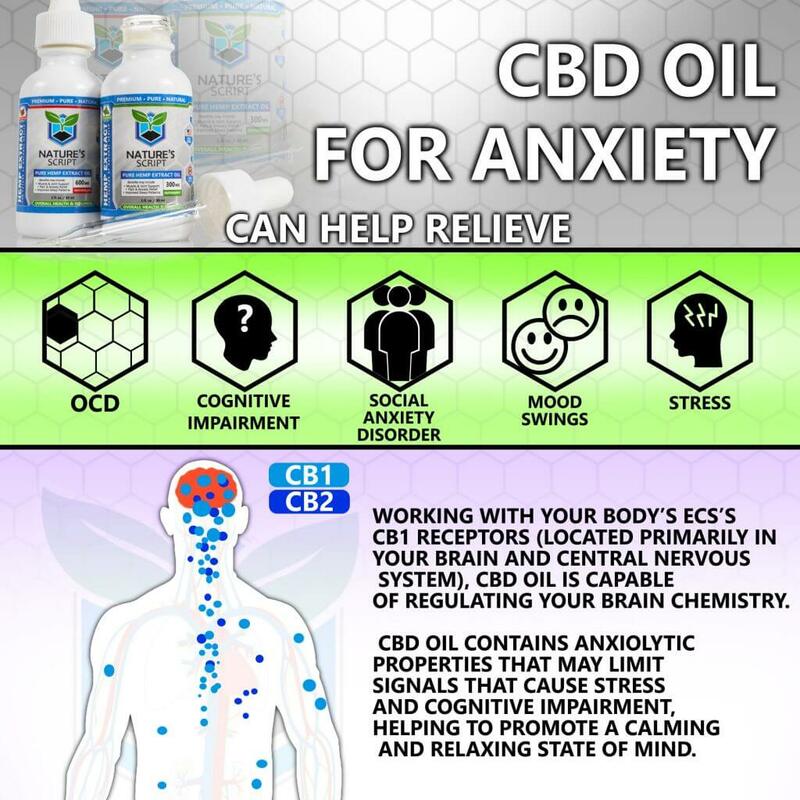 Since anxiety can be brought about at any time or anywhere, it’s best to have easy access to CBD’s natural benefits. Nature’s Script provides an assortment of different CBD Hemp Extract products that can help you ward off anxiety and stress throughout the day. While you may have never considered vaping before, Nature’s Script Hemp Extract E-Liquids are a fast, accessible and delicious way to attain your daily CBD needs. Our E-Liquids contain all-natural CBD and are entirely free of nicotine and THC. Vaping CBD is a much faster form of absorption compared to consuming CBD, allowing you to obtain relief almost instantly. Our CBD Hemp Capsules contain a potent dose of CBD and natural botanicals. Nature’s Script CBD Capsules are easily digestible and help to promote a clear and tranquil state of mind. Our CBD Capsules are THC-free and will not aggravate anxiety-related symptoms. For our other CBD Hemp related products, visit Nature’s Script Shop.